To catch you up on some of the recent culinary delights that have come out of my kitchen (well, culinary attempts, at least…) here is an update on two different dishes. The first was a Thai-style pumpkin soup made after Tawn requested that we have some soup for dinner one evening. I didn’t follow a particular recipe with this one but just pulled it together by taste. Base ingredients: pumpkin, butternut squash, onions, carrots, celery, chicken stock. Aromatic ingredients: lemongrass, galangal root (similar to ginger but less harsh), bay leaves, curry powder, cayenne pepper. Finishing ingredients: fish sauce, coconut cream, palm or brown sugar. Optional ingredients for garnishing: bacon, cilantro, sour cream or parmesan cheese. Here’s a picture of the finished product, which tasted wonderful. Coupled with a video that shows the whole “making of”. 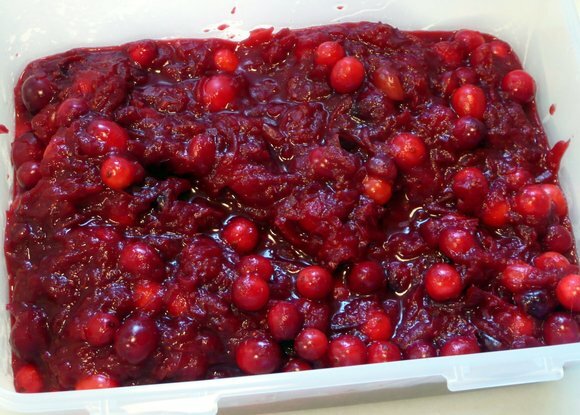 The second dish is a cranberry-beet relish that I made for our potluck Thanksgiving over at Vic’s house. I stumbled across several recipes for this and so improvised a bit. Sautee a chopped onion and then add the cranberries, stirring for a few minutes but not cooking so much that they begin to pop. 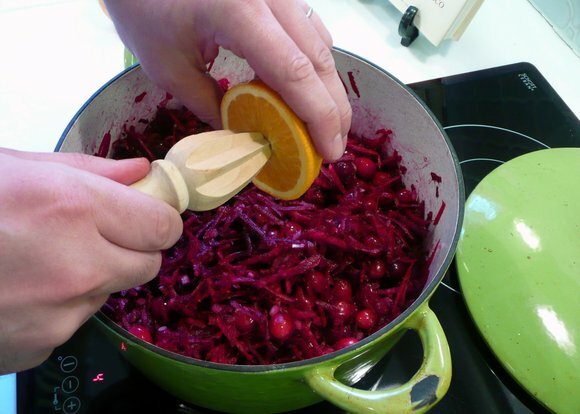 Add shredded raw beets – this would actually be gorgeous with golden beets – and cook a while longer until the mixture softens. For flavoring add the zest and juice of two oranges. Sweeten to taste with maple syrup. The natural sugars in the beets offset much of the tartness from the cranberries, so I find that you don’t need much maple syrup. If needed, add a little bit of salt to the mixture. Let cook until at a nice consistency. Since I like to still have some whole berries left, I reserve about a cup of berries and add them later in the cooking process so they don’t pop before the relish is done. 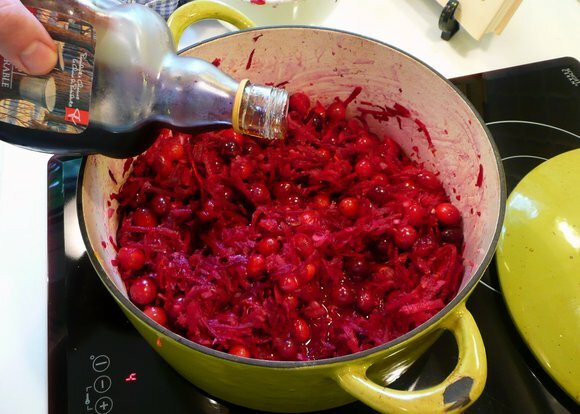 This turned out as a very nice alternative to regularly cranberry relish and several diners commented that while they don’t normally enjoy cranberry relish, they particularly liked this recipe. This entry was posted in Uncategorized and tagged cooking, Cranberry, food, Pumpkin, Soup, Squash, Thanksgiving by christao408. Bookmark the permalink. Excellent video, Chris :)Watching this has me inspired. I didn’t think I could do a self-filmed cooking video; but now that I’ve seen how you’ve done yours, I think I might be able to do it. Thank you. This soup also looks very nicely done, and I’m going to try this. I can taste it in my mouth, and I think it not only has a very good flavor profile, but it has good mouthfeel also. Have you tried this cold as well? Another wholesome recipe from your kitchen. Pretty soon, I can see a cookbook coming! That looks fantastic 🙂 I love anything pumpkin. Butternut squash is pretty darn good, toooo. @arenadi – THat would mean you’d have to show yourself. Unless you wore a mask! Ooooh you could wear one of those bandit masks, like guys use to when they’d rob trains in the West! That’d be kind of hot. I would watch that video. Those two dishes will go into my collection. 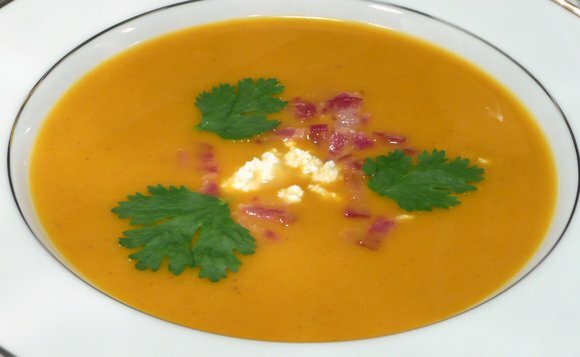 I have never made pumpkin soup and have enjoyed it at the club only a couple of times. I love soups, period. But I am the only one at home, so I hate to make a huge batch and then have to waste it. Perhaps I can put the rest in a zip lock bag and freeze it. 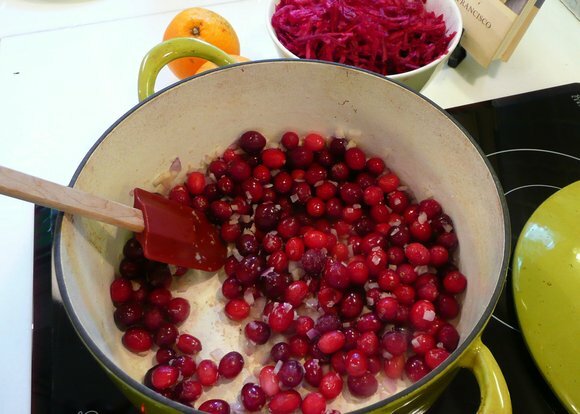 I will make the cranberry/ beet reslish for the holiday dinner. Thank you Chris. This is so very tasty looking that I’m going to try it myself. Also Thank-you for the blender tip. I am changing my wish list from a new blender (the one we got as a wedding gift died several years ago and I’ve been debating on replacing it) to the version you had in the video. @arenadi – The bandanas, yes! Like bandits! It may arouse me though. I’ve got a thing for that + muscles, mm.SOooo then you know about knives! I’m asking for one GOOD knife for christmas, but all of the knives I’ve looked at (forged only) are typically too expensive. Any suggestions? From anyone? I want a goood multifunctional knife. @secade – Hahaha :)As for knives, I’m actually writing a post right now on equipment. Kind of a christmastime buying guide for picking up new gear. What kind of budget are you looking at for your knife? @arenadi – I’m not 100% sure; I don’t really know enough about knives to put together a ‘budget’ on a knife quite yet. My mom is getting me a nice wok, and my step-mom some good stainless steel mixing bowls; other than that, I mostly want a fancy knife and maybe a big heavy wooden cutting board. I am trying to put together the basics for a good kitchen for when I move out to my future job, but I’m just not 100% sure of what I should get! That was a lot of words. Ummm, maybe like 80-100$? Does he say, “I want soup for dinner.” and you went and made soup? @arenadi – Thanks for the kind words, Michael. The audio on this one was a pain. I need to find a better way to shoot audio as I go. My camera, not being a video camera but a point-and-shoot that also films video, pics up so much background noise. Stand up shots done separately and audio recorded after the fact don’t always match in tone and atmosphere. My preference would be to play the director, cinemaphotographer and editor roles and to leave the on-screen talent to someone else. As for the soup, yes I tried a bit of it cold the next day and I thought it was really enjoyable. The blended pumpkin gives it a lot of richness on the tongue and of course the ccream of coconut helps in that regards, too. I have to say that this dish was particularly good, flavor-wise. Better than many things I cook that are tasty but not incredible. @CurryPuffy – One filled with either incredibly inexact recipes that will frustrate others or filled with recipes ripped off from elsewhere, which will frustrate their copyright holders! @yang1815 – Thank you. @Wangium – He suggested that soup would be a nice choice for this cooler weather and, agreeing, I set out to prepare it. It isn’t a full service restaurant, if that’s what you want to know. =D@maxwebr – Thanks Bruce. I was actually a bit disappointed with the audio in this one. I really need to find a better way to capture audio when I film without investing a lot in new gear. @ZSA_MD – Here in Thailand our markets actually sell slices of pumpkin and relatively small squashes so I can make smaller batches of soup. I realize that in the US that batches might be larger but the soup freezes beautifully, Zakiah. @murisopsis – May I recommend the Kitchen Aid? It has a stainless steel shaft whereas many other immersion blenders have plastic shafts. Those, of course, are less durable in hot situations and more prone to breakage and staining. @secade – @arenadi – For cutting boards, check out Totally Bamboo. Excellent quality and much more durable than other types of wood cutting boards you may find at local stores. Prices are reasonable, too. For $80-100 you can definitely find a good quality chef’s knife. Cook’s Illustrated has a full review of chef’s knives in various prices ranges. Their tests and rankings are very authoritative and because they accept to advertising, very unbiased. You can get a free 14-day trial to their website and check out the results of their knife tests, among other things. @christao408 – Thanks, Chris, that article helped! I’m going crazy trying to pick out a good knife. @christao408 – I’m guessing your camera doesn’t have an auxiliary audio input right? =/You know, I’m really surprised you don’t own a video camera at all, considering how much you enjoy doing this and how GOOD you are at it, especially — and you’re doing this on a point and shoot camera. I think you’re someone who could really benefit from the better gear! @secade – @christao408 – I definitely agree here.I use Totally Bamboo, if you look in a lot of my shots, thats one of their cutting boards I’m shooting on hahaha. I like the way it looks as background for some of the shots. They’re also probably the best cutting boards you can buy. @arenadi – I’ve used one before at a friend’s, I’m pretty sure. there are a LOT of options; what do recommend as a starter? I’m on amazon now. @secade – It’s really uncommon to have to use a giant one, and giant ones take up a lot of space. Just choose one appropriate for the size of meals/ food you have to prep. I use one that’s roughly 14×14 or so. Oooo, both of those look amazing. Unfortunately I don’t think I could get Phil to eat the relish. He will not eat beets! @arenadi – Yes, I recognized the board. Gary (CurryPuffy) uses one, too, and it appears in some of his dinner photos from time to time. 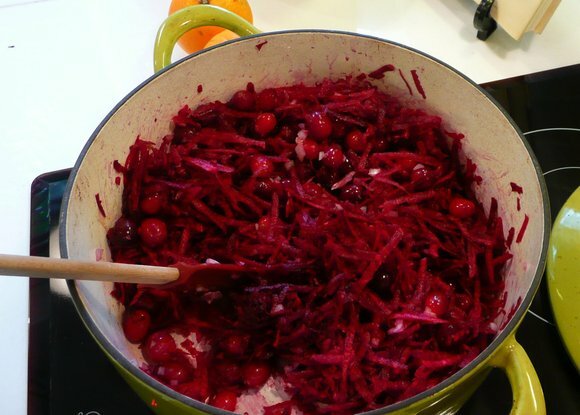 @TheCheshireGrins – You know, Meg, I didn’t tell anyone there were beets in it until after dinner! Phil might never know what he ate. @arenadi – Video takes a lot of time and energy and I realize that if I had a proper video camera I would just get too distracted. Plus, I want to focus more on the still photography. @secade – The Kona Groove from Totally Bamboo was my recent purchase. 12.5 x 18 x 1 with a channel running around the edge on one side. Large enough for pie crusts but not too overwhelming for the countertop. $40 from their website. @arenadi – oh yeah… I can’t wait to see your video too. Those ingredients in the soup sound delicious! Coconut cream, palm sugar, lemongrass…all YUM! !